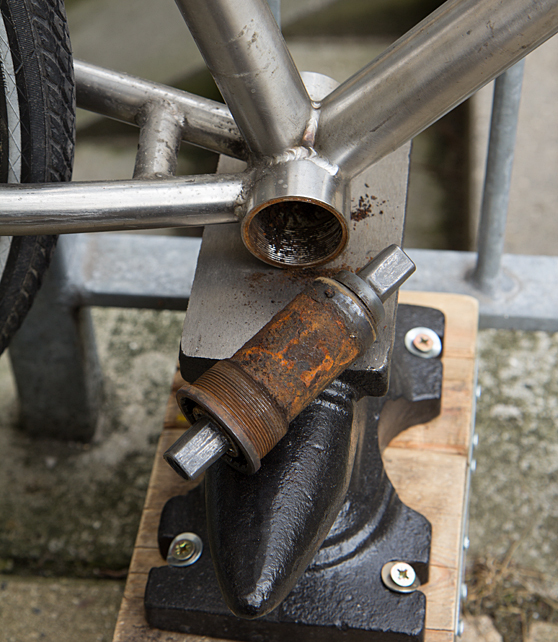 Due to corrosion and/or failure to grease the threads before a bottom bracket cartridge was originally installed, it can become so seized that normal hand tools cannot loosen it from the frame when you want to replace it due to worn bearings. 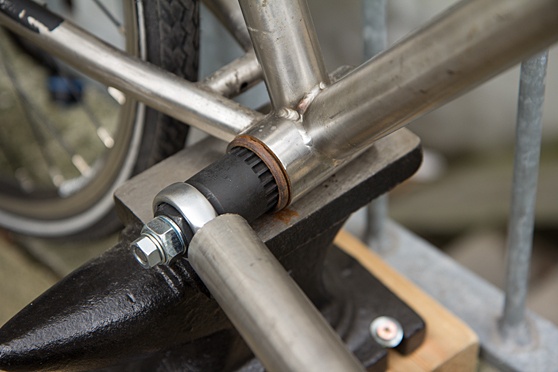 To loosen a stuck bottom bracket you need a means of rigidly securing the special bottom bracket key to the bottom bracket so it won't skip or twist out of the bracket and a lot of torque/leverage to turn the bottom bracket key. To fasten the key to the BB's axle, use a long bolt or a piece of threaded rod plus a nut in the M8x1 (fine thread pitch) size. Note that bolts or threaded rod plus nuts with this thread pitch can be a bit hard to find, as the most common variant of metric 8mm thread has a pitch of 1.25mm, not the 1.00mm you want in this case. Alternatively, narrower BB keys exist that allow the shorter, original crank arm bolts and a suitable washer to be used for securing the key to the BB. At this point, you can apply some penetrating oil to the threads and try to loosen the BB using ye olde dual wrench torque amplification trick, but it may not be enough for the large-diameter seized thread we are dealing with here. Try to remove the left side (non-flanged) of the BB first using counter-clockwise rotation and then when that is out, continue with the right side (flanged), which has reverse/left-hand threads so use clockwise rotation to unscrew it. 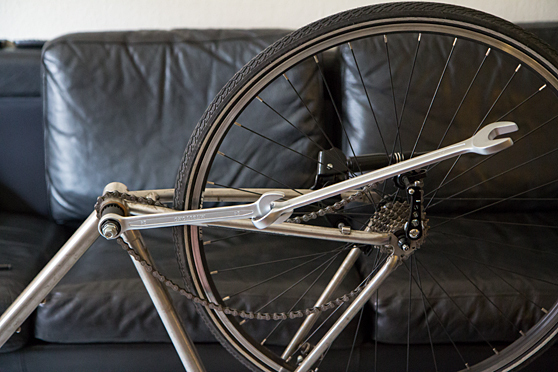 In my case, the left side came off relatively easily, but the right side of the BB was mercilessly stuck and I needed more leverage that normal wrenches could supply, plus a more rigid fixation of the bike. Sacrifice a medium quality wrench and cut off the "open" end with an angle grinder. 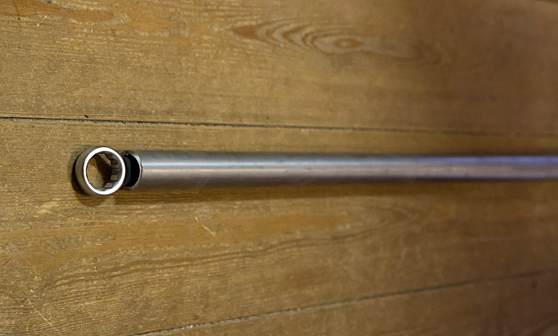 This way you will be able to fit a long steel pipe over the wrench. 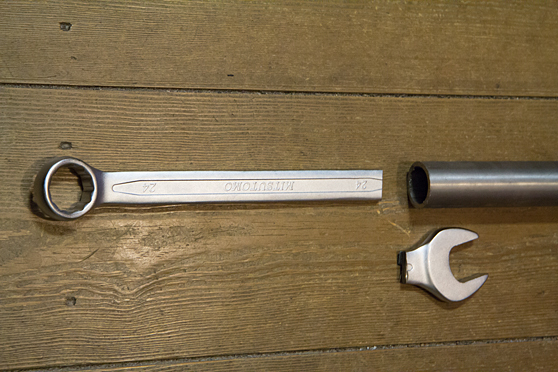 You could also use an adjustable spanner (thus cutting perhaps not needed), but I would advise against it, as it is not as strong as a fixed wrench. With loud snaps and creaks, the BB finally came loose while fine rust powder came out of the thread. It seems the bike mechanic that assembled the bike years and years ago did not use grease on the threads. Oh, what a mess the old BB was. I have since been told that the excessive corrosion was most likely accelerated by the fact that the frame is made from stainless steel, which "attacks" the lesser metal of the BB through a galvanic connection. A preemptive measure against this could be to use BBs with plastic mounting cups so there would be no direct connection between the two metals. After the old BB was removed, the inside thread of the frame was cleaned with WD40 and an old toothbrush and greased before the new BB was installed. 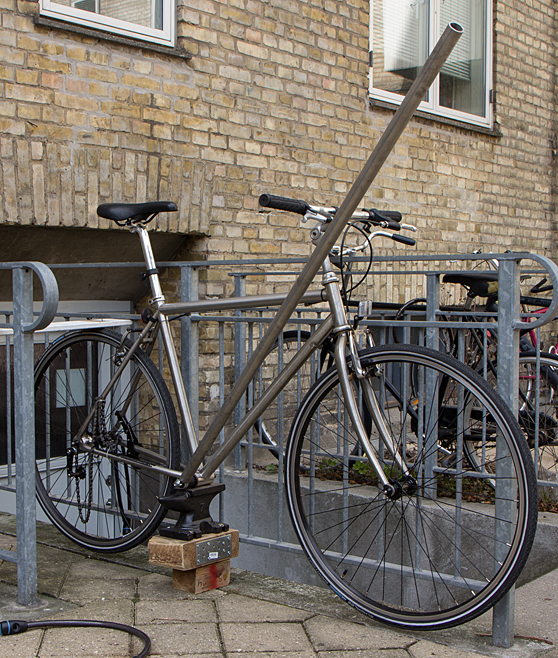 If you live in the Copenhagen area and want to borrow the BB wrench of doom, feel free to contact me. 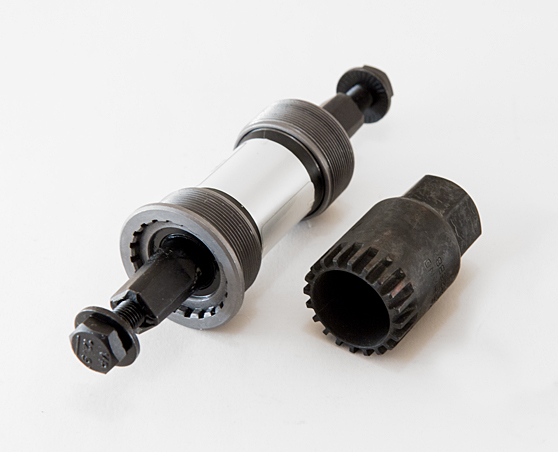 If you live outside the Copenhagen area and you just need to borrow the threaded rod to fasten your own BB key, I can send a piece of rod plus a matching nut if you pay the postage plus return postage. Send me a message and we can figure something out. Please note that shipping is limited to Denmark. 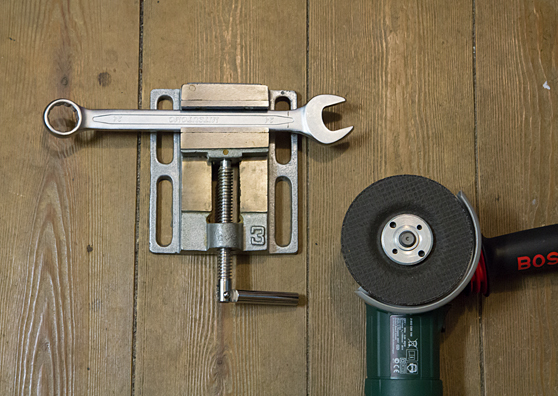 Update August 2015: If you have a bottom bracket with a broken-off piece of the crank arm bolt stuck inside the axle (preventing you from securing the BB key with a bolt or piece of threaded rod), you can keep the key from slipping out by sandwiching the BB and key with two blocks of wood held together with F-clamps. Drill a hole in the left block so the protruding axle will fit in it and the left block will rest on the frame. This fixture will need to be reset a lot of times as you turn the wrench, so the method is slow, but it works. 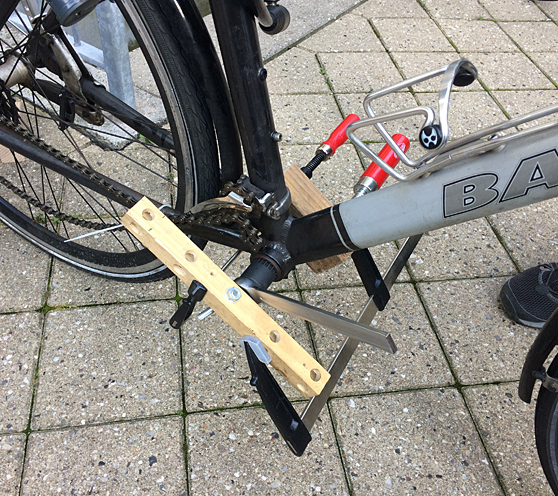 Others have also had luck with another technique, which involves clamping the BB key vertically in a table-mounted vise, putting the bike horizontally on the key and then pulling the bike around, using the frame itself as a lever while the BB key is stationary. But in any case, making sure the BB key will not skip or twist out is essential.